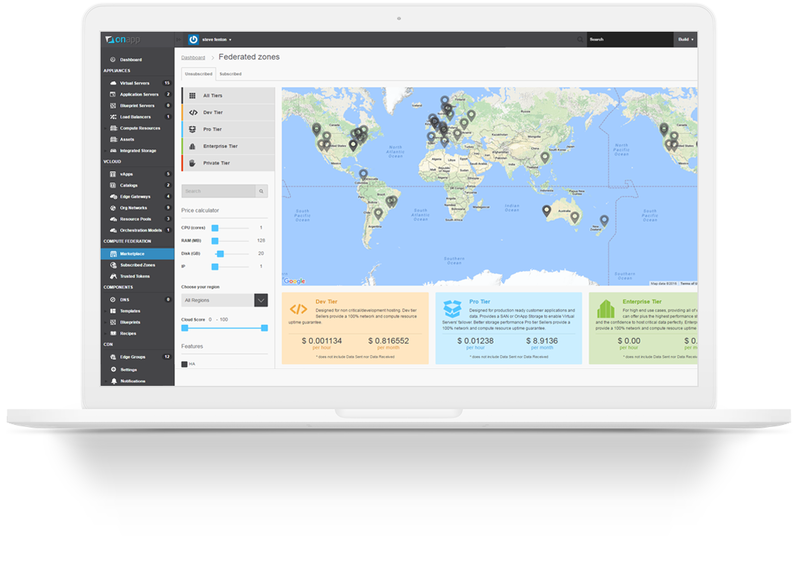 The global cloud at your fingertips. management and scale on demand. The OnApp Federation simplifies multi-cloud management by bringing distributed cloud infrastructure into a unified provisioning and billing environment. You can manage multiple clouds through a single control panel, provision cloud services at any location, and move workloads fluidly between different clouds. The OnApp Federation also gives you access to a global network of cloud infrastructure that you can use on demand, as a seamless part of your service – and a global marketplace you can use to sell spare capacity. Use the Federation to bring distributed private and public cloud infrastructure into a single pane of glass. Manage multiple clouds in one place, and provision cloud services at any location through one control panel. Having one login, one portal, and one set of metering, monitoring, billing and chargeback tools for multiple clouds reduces management effort, and enables you to optimize infrastructure utilization. The Federation marketplace offers private and public cloud infrastructure across the Americas, Europe and Asia-Pacific. Use the Federation to add short-term or long-term scale to your local cloud, without having invest in new hardware. With locations in 43 countries, the Federation makes it easy to handle customer requests for more capacity, support their activities in specific regions, or test new markets before deciding to build new infrastructure. The OnApp Federation features our unique ‘Cloud Motion’ technology, which enables workloads to move fluidly between OnApp clouds that use our integrated software-defined storage system. You can migrate virtual servers automatically between OnApp clouds. Workload portability is increasingly important for your enterprise customers. With the Federation, you can optimize workload placement to handle their changing requirements for price, performance, data sovereignty and compliance. The Federation marketplace works as a sales channel for you too. With just a few clicks, you can assign hardware resources to a ‘Federation zone’, publish it to the marketplace, and get paid when those resources are used by other service providers, to provision cloud to their clients. The Federation creates new infrastructure revenue with no sales or marketing effort. If you have infrastructure with unique performance or compliance characteristics, or in an unusual location, it’s an easy way to reach new service provider customers – or simply to monetize spare capacity.